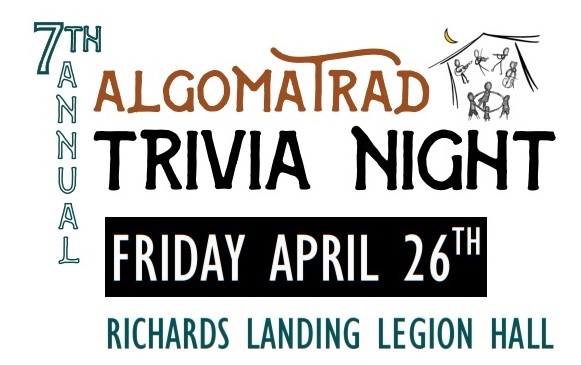 The AlgomaTrad Trivia FUNd-raiser is a night of friendship and friendly competition with the goal this year of raising money for AlgomaTrad’s PERMANENT HOME on St. Joseph Island. We hope you will join us to make it a success! Buy a table for $200.00 and then split the cost by selling spots at your table to your friends. A table can hold a maximum of 10 people who will compete as a team in a trivia challenge. There will be five (5) rounds of ten (10) questions each. The winning team will have the highest score over all the rounds. If you don’t have a table but still want to sign up as an individual or smaller group we will make up groups of 10 for you. Book your table or a single ticket (we’ll find you a team!) by Tuesday, April 18 on this page or by email music@algomatrad.ca or call 705 257 6106. Back by popular demand (and general expectations): there will be brainfood snacks, cash bar, draws AND MUSIC. The Community Challenge. Enter your community group, co-worker group, or a party of friends for a table of 10. Winning table’s entry fee donated to the charity of their choice. 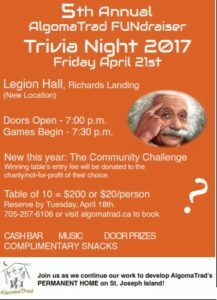 Except for the Community Challenge, there are none….The winning team gets bragging rights and their team’s name engraved on a special AlgomaTrad Trivia trophy, which they can keep in their possession until the next trivia challenge. Door prizes will be awarded throughout the evening. ps: a request – our goal is fill the Hall with at least 15 tables again this year; as we promote this event primarily by word of mouth, please pass this on AND help to ‘fun’d-raise for a wonderful organization.